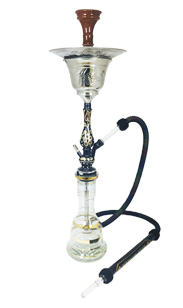 Khalil Mamoon is known worldwide for manufacturing what many regard as the finest Egyptian hookahs on the planet. 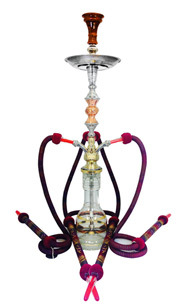 Khalil Mamoon hookahs combine traditional designs and style with superior quality and exceptional durability. At SouthSmoke.com, we feel that Khalil Mamoon is designed for the smoker that appreciates fine craftsmanship. If you understand what it means to smoke with style and sophistication, Khalil Mamoon is the brand for you. 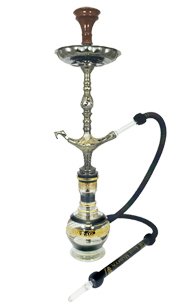 When you own a Khalil Mamoon hookah, you'll surely feel like you're owning a part of history. 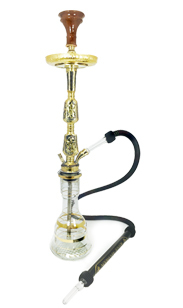 Browse our regal offerings and find the perfect Khalil Mamoon for your living room or hookah bar. 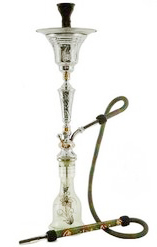 We have a truly massive selection of these Egyptian-made hookahs for your perusal. No matter what hookah flavors you're smoking, you can literally taste the history as you inhale the smoothest of smoke from a time-tested Khalil Mamoon hookah. 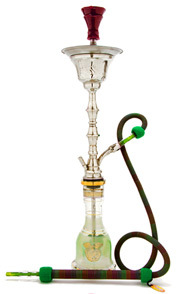 These Egyptian hookahs are some of the most sought-after on the market. With the amount of craftsmanship that goes into each and every Khalil Mamoon hookah, it's no wonder why Khalil Mamoon hookahs are world-renowned and treated like pieces of art. Khalil Mamoon hookahs are still produced by hand in the heart of Cairo, Egypt with the same quality and craftsmanship that made the brand famous. A Khalil Mamoon hookah is more than merely a hookah; it is a testament to who you are, as well as the type of person you wish to be. When you smoke from a Khalil Mamoon hookah, you are saying to the world, "I understand tradition and class. I accept only the finest things in life because I have earned them. I want only the smoothest of smoking experiences, and I want the best." 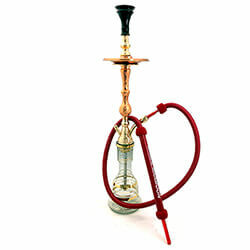 Khalil Mamoon hookahs come in a wide variety of beautiful styles suited for any type of smoker. From hookahs boasting the classic colossal Khalil Mamoon stem to smaller, more practical smoking pieces, there's something here for everyone. 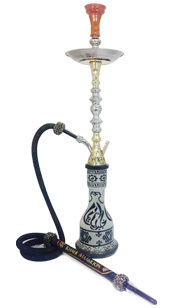 If you're looking to make a statement, the Khalil Mamoon Basha Three Hose hookah is a true work of art. 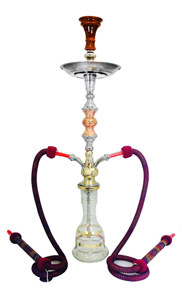 Standing 36 inches tall, this hookah is sure to impress those who like to "go big or go home." 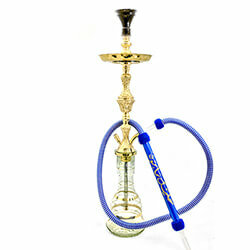 For something on the smaller side, try the smoothness and ease of portability of the Khalil Mamoon Safari Single Hose. You'll love packing this up and taking it to a friend's house for intimate smoke sessions. These are just a few options at SouthSmoke.com; you can choose from many, many more! Whether you want to feel like royalty and relax in your own personal hookah lounge, or just get together with a few hookah-loving friends, Khalil Mamoon's diverse and exotic offerings can meet your needs. Whichever style you choose, know that each of their hookahs is crafted by hand. This means that every KM hookah is as unique as you are. 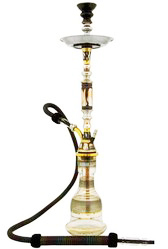 With SouthSmoke.com, you'll never have to worry whether your KM hookah is a knock-off or not. 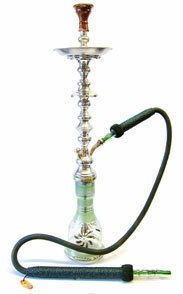 With the rising popularity of hookahs, many hookahs of less-than-stellar quality are appearing on the market. 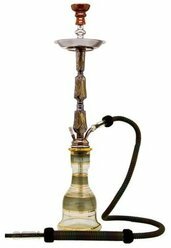 So with a hookah like Khalil Mamoon, which is so dependent on its authenticity, it's important to know you're getting exactly what you're looking for. Please view our KM Hookah Disclaimer before ordering one of these beautifully handcrafted hookah models. This disclaimer explains our promise to you that every KM hookah you order is the real thing. From each handcrafted Khalil Mamoon vase to its stem, you are getting a guarantee of authenticity and quality you can't get anywhere else. Ready for a taste of the finer things in life? 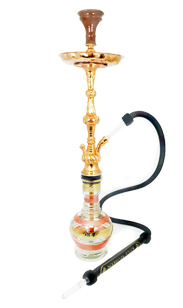 Choose the best Khalil Mamoon hookah to fit your style and personality and start living the high life today!